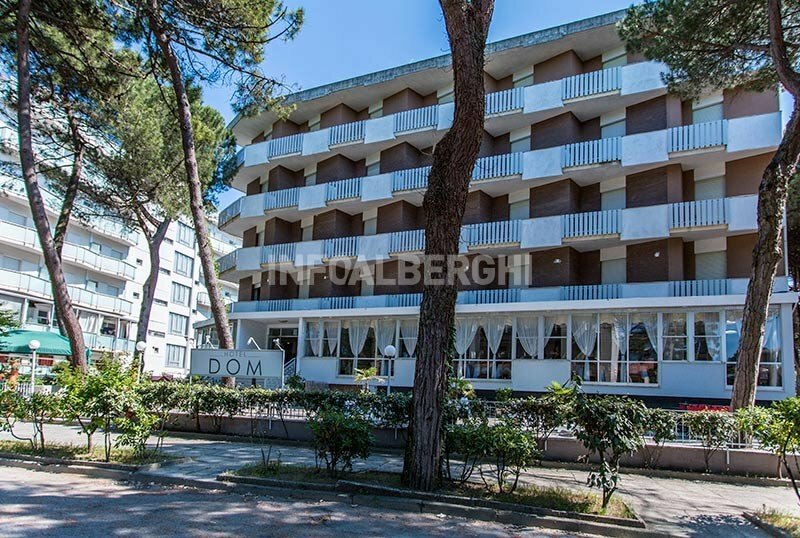 The Hotel Dom B & B is the first "Just Bed Hotel" in Milano Marittima, a low cost accommodation formula that includes self-service breakfast buffet, goodnight buffet and many agreements with restaurants, beach and parks. The hotel is pet-friendly and accepts animals of all sizes at no additional cost. The hotel is just a few steps from the Parco del Pino park and less than a 10-minute walk from the equipped beach. The center of Milano Marittima can be reached by car in 5 minutes or with a walk of about 20 minutes. All rooms are comfortable and modernized, with air conditioning and ceiling fans, balcony, central safe, satellite TV and digital terrestrial, WI-FI, private bathroom with shower, hairdryer and toiletries, cots on request. FAMILY: multiple rooms and connecting families are available that can accommodate up to 6 people. Large garden with gazebos, tables, relaxation area and games; free use of bicycles and elevator. The hotel has a large hall with living room, "Dolce Vita" room furnished in a Fellini style, where the "good morning buffet" (8-12), the "goodnight buffet" (23.00 hours) is available. 00) and tables to eat. And "Cyber Point" room has games for children, board games, carambola, PC with printer and WI-FI area. PARKING: free, private and open, subject to availability. AIR CONDITIONING: all rooms are air-conditioned, without additional costs (starting from June). CONVENTIONS: restaurants, equipped beach, spas, amusement parks, gym, swimming pool, waterslide, nightclubs, law enforcement, INAIL / INPS. On request: shuttle service (subject to availability) and guided guided tours. BREAKFAST: "good morning buffet" in the formula "Just Bed Hotel" with hot drinks, water, unlimited free juices until 12. In the hotel: playground area both inside and in the garden, ping-pong, billiards, PC, board games. Baby sitter and pediatrician on request and for a fee.